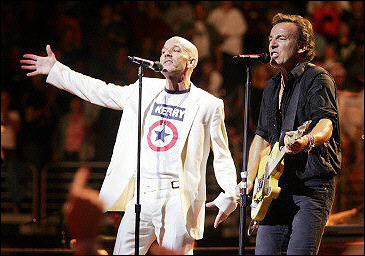 Bruce performde the song 6 times, during the vote for change tour, always together with Michael Stipe. 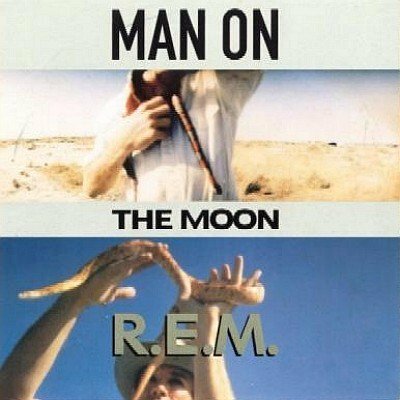 "Man on the Moon" is a song by R.E.M., released as the second single from their 1992 album Automatic for the People. The lyrics were written by lead singer Michael Stipe, and the music by drummer Bill Berry and guitarist Peter Buck, and credited to the whole band as usual. The song was well received by critics. It remains one of R.E.M. 's most popular songs and was included on the compilations In Time: The Best of R.E.M. 1988–2003 and Part Lies, Part Heart, Part Truth, Part Garbage 1982–2011. Lyrically, the song is a tribute to the comedian and performer Andy Kaufman with numerous references to his career including his Elvis impersonation, wrestling, and the film My Breakfast with Blassie. The song's title and chorus refer to the moon landing conspiracy theories as an oblique allusion to rumors that Kaufman's death in 1984 was faked. The song gave its name to Man on the Moon (1999), Miloš Forman's film based on Kaufman's life, and was featured prominently in the film's soundtrack. Hey baby, are you having fun? Hey Andy, are you goofing on Elvis?